BackgroundPreventative health services are a pediatric health care cornerstone, which strives to promote health and prevent illness and injury. In Israel, Maternal Child Health Clinics (MCHC) provide these well child services for ages 0–6 years. MCHC care includes physician visits; however, the physician’s role is not well defined. The study purpose was to provide a basis for setting policies that determine the role of physicians in the provision of MCHC services. To get broad input we included MCHC stakeholders - parents, MCHC physicians, non-MCHC physicians and MCHC nurses, specifically to obtain insights regarding the MCHC physician role and to characterize the stakeholder demographics, service utilization, and practice patterns.MethodsProfessional groups completed self-administered written questionnaires (n = 398). Parents were interviewed during MCHC visits using a structured questionnaire (n = 1052). All provided demographic data, service characteristics and agreement with ten potential MCHC physician roles - Physical Examination, Abnormal Health Condition Detection, Developmental Screening, Anticipatory Guidance, Parent-Child Interaction Counseling, MCHC Staff Advice, Children-at-Risk Detection, Growth Surveillance, Vaccination Counseling, and Inter-physician Communication.ResultsThe study findings seem to indicate a true shortage of MCHC physicians. The median age of MCHC physicians was significantly higher than both non-MCHC physicians and MCHC nurses. There was agreement among stakeholders regarding some roles (Physical Examination, Developmental Screening and Detection of Abnormal Health Conditions) but not others. Most parents reported having at least one MCHC physician encounter. Parents who did not visit the physician were younger and had fewer children.ConclusionsStakeholders view MCHC physicians as integral to MCHC care. Roles traditionally regarded as part of primary prevention were less likely to be attributed to physicians than screening roles considered secondary prevention.Updating and standardization of the MCHC physician role is needed along with a national strategy to recruit and train MCHC physicians.to ensure optimal pediatric preventive health care in Israel. The association between continuity of care and outcomes: a systematic and critical review. Numerous studies have tried to determine the association between continuity and outcomes. Studies doing so must actually measure continuity. If continuity and outcomes are measured concurrently, their association can only be determined with time-dependent methods. To identify and summarize all methodologically studies that measure the association between continuity of care and patient outcomes. We searched MEDLINE database (1950-2008) and hand-searched to identify studies that tried to associate continuity and outcomes. English studies were included if they: actually measured continuity; determined the association of continuity with patient outcomes; and properly accounted for the relative timing of continuity and outcome measures. A total of 139 English language studies tried to measure the association between continuity and outcomes but only 18 studies (12.9%) met methodological criteria. All but two studies measured provider continuity and used health utilization or patient satisfaction as the outcome. Eight of nine high-quality studies found a significant association between increased continuity and decreased health utilization including hospitalization and emergency visits. Five of seven studies found improved patient satisfaction with increased continuity. These studies validate the belief that increased provider continuity is associated with improved patient outcomes and satisfaction. Further research is required to determine whether information or management continuity improves outcomes. © 2010 Blackwell Publishing Ltd. Rethinking well-child care in the United States: an international comparison. The increasing scope of health supervision recommendations challenges well-child care delivery in the United States. Comparison of the United States with other countries' delivery systems may highlight different assumptions as well as structural approaches for consideration. Our goal was to describe the process of well-child care delivery in industrialized nations and compare it to the US model of child health care. Literature reviews and international experts were used to identify 10 countries with unique features of well-child care delivery for comparison to the United States. Key-informant interviews using a structured protocol were held with child health experts in 10 countries to delineate the structural and practice features of their systems. Site visits produced additional key informant data from 5 countries (The Netherlands, England, Australia, Sweden, and France). A primary care framework was adapted to analyze structural and practice features of well-child care in the 10 countries. Although well-child care content is similar, there are marked differences in the definitions of well-child care and the scope of practice of primary care professionals and pediatricians specifically who provide this care across the 10 countries. In contrast to the United States, none of the countries place all well-child care components under the responsibility of a single primary care provider. Well-child care services and care for acute, chronic, and behavioral/developmental problems are often provided by different clinicians and within different service systems. Despite some similarities, well-child care models from other countries differ from the United States in key structural features on the basis of broad financing differences as well as specific visions for effective well-child care services. Features of these models can inform child health policy makers and providers in rethinking how desired improvements in US well-child care delivery might be sought. 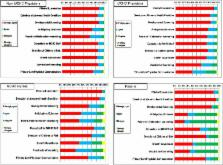 Paediatric primary care in Europe: variation between countries. Although it is known that differences in paediatric primary care (PPC) are found throughout Europe, little information exists as to where, how and who delivers this care. The aim of this study was to collect information on the current existing situation of PPC in Europe. A survey, in the form of a questionnaire, was distributed to the primary or secondary care delegates of 31 European countries asking for information concerning their primary paediatric care system, demographic data, professionals involved in primary care and details of their training. All of them were active paediatricians with a broad knowledge on how PPC is organised in their countries. Responses were received from 29 countries. Twelve countries (41%) have a family doctor/general practitioner (GP/FD) system, seven (24%) a paediatrician-based system and 10 (35%) a combined system. The total number of paediatricians in the 29 countries is 82 078 with 33 195 (40.4%) working in primary care. In only 15 countries (51.7%), paediatric age at the primary care level is defined as 0-18 years. Training in paediatrics is 5 years or more in 20 of the 29 countries. In nine countries, training is less than 5 years. The median training time of GPs/FDs in paediatrics is 4 months (IQR 3-6), with some countries having no formal paediatric training at all. The care of adolescents and involvement in school health programmes is undertaken by different health professionals (school doctors, GPs/FDs, nurses and paediatricians) depending on the country. Systems and organisations of PPC in Europe are heterogeneous. The same is true for paediatric training, school healthcare involvement and adolescent care. More research is needed to study specific healthcare indicators in order to evaluate the efficacy of different systems of PPC. Parental perception, worries and needs in children with epilepsy. Quality of life reporting by parent-child dyads in Japan, as grouped by depressive status. Attitudes of parents and health care professionals toward active treatment of extremely premature infants.